If I Can’t Dance, I Don’t Want To Be Part Of Your Revolution publishes artists’ books, readers, and research related to its Performance in Residence research programme, Fields of Inquiry, and Artist Commissions, and alongside special projects with associated artists and partnering art organizations and publishing houses. The books are available for purchase from this webstore (shipped within 7 days) or our Amsterdam office (Westerdok 606-608) and for distribution please contact Idea Books. The Readers originate in the Fields of Inquiry that circumscribe each of If I Can’t Dance’s two-year programmes, and comprise selected texts read in the accompanying Reading Groups. This series is designed by Joris Kritis and Julie Peeters. 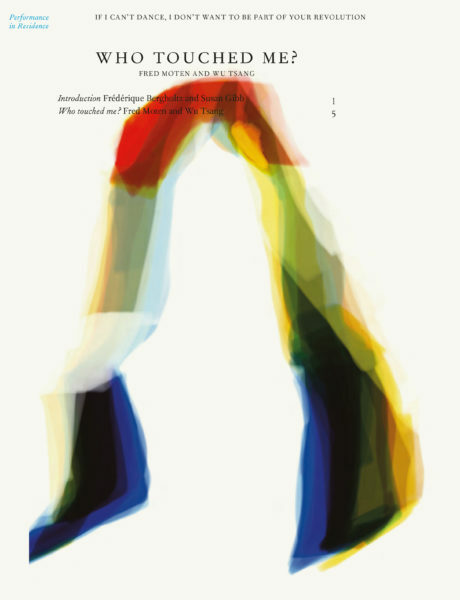 Rereading Appropriation came out of If I Can’t Dance’s Edition V – Appropriation and Dedication (2013–14), a theme that looks at the artistic strategy of appropriation through affect, to explore how that strategy is reconfigured by “reciprocal investment” as based on connecting, acknowledging, and being porous to material. 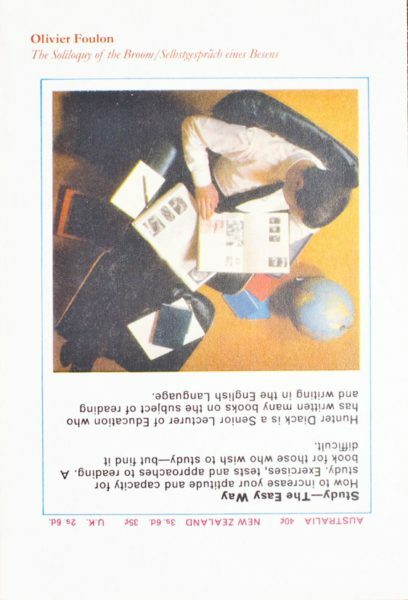 The texts consider relations between property and propriety, ownership and authorship, and subjecthood and agency, departing from the 1970s/1980s New York scene of globalizing financial relations to move into other territories of practice and thought. Included here are essays from art history, feminist theory, political economy, anthropology, and artists shared by Reading Groups in Amsterdam, New York, São Paulo, and Toronto, along with new commissions and statements by Reading Group members and artist pages. Reading / Feeling examines affect, a term that delineates a field where the personal and political meet in sensory movements between bodies. A pre-emotional experience, affect constitutes the social and economic relationships that make up the fabric of society. Reading / Feeling considers the meaning of affect in theory and artistic practice through texts by theoreticians, artists, and curators read in If I Can’t Dance’s Reading Groups in Amsterdam, Toronto, and Sheffield as part of the programme for Edition IV – Affect (2010–12). 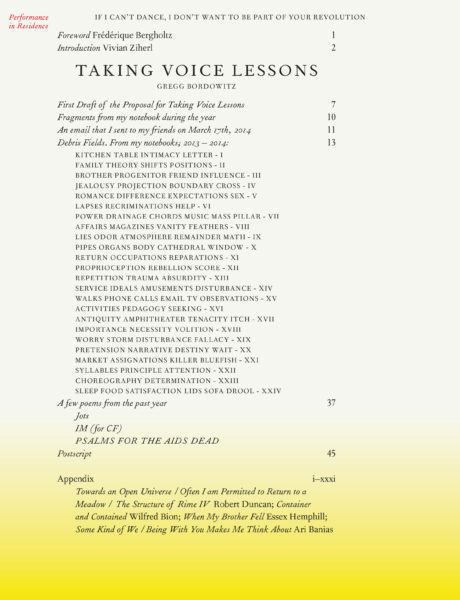 It also includes three new essays, short statements by Reading Group members, and artist pages. (Mis)reading Masquerades focuses on the notion of masquerade from an interdisciplinary perspective, bringing together texts shared and read among more than fifty artists, curators, writers, and theoreticians who comprise the If I Can’t Dance Reading Group for Edition III – Masquerade (2008–10) and research projects with the Dutch Art Institute, Enschede and Piet Zwart Institute, Rotterdam. The texts address masquerade through ideas of transgression, gender identity and subversion, gesture, the carnivalesque, the construction of subjectivity, authorship, mimesis, and alterity. New essays by writers and curators from the contemporary art field accompany introductions to thematic groupings of texts by Reading Group participants. 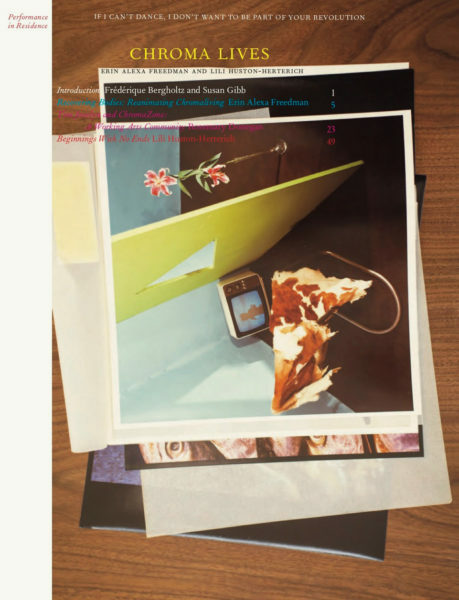 A range of printed matter is produced to accompany If I Can’t Dance’s Artist Commissions ranging from artist books to monographs to catalogues of individual works. To Become Two: Propositions for Feminist Collective Practice offers a narrative of artist Alex Martinis Roe’s research into a genealogy of feminist political practices in Europe and Australia since the 1970s including: Milan Women’s Bookstore co-operative; Psychanalyse et Politique, Paris; Gender Studies (formerly Women’s Studies) at Utrecht University; a network in Sydney; and Duoda – Women’s Research Centre and Ca la Dona, a women’s documentation centre and encounter space in Barcelona. Drawing from their practices and experiences, Martinis Roe’s research proposes a trans-generational approach to feminist politics. 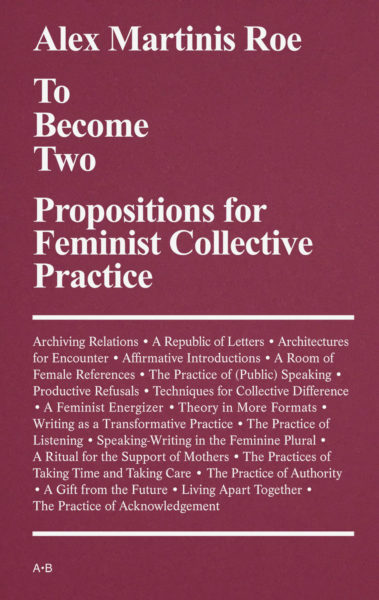 This is further developed as a handbook of twenty new propositions for feminist collective practice formed in collaboration with a network of contributors through experiments with historical practices. Requiem for Mirrors and Tigers catalogues the trajectory of a cycle of performances of the same name, through which artist Naufus Ramírez-Figueroa attempts to exhaust his interest in the Guatemalan Civil War as a recurring subject of his work. 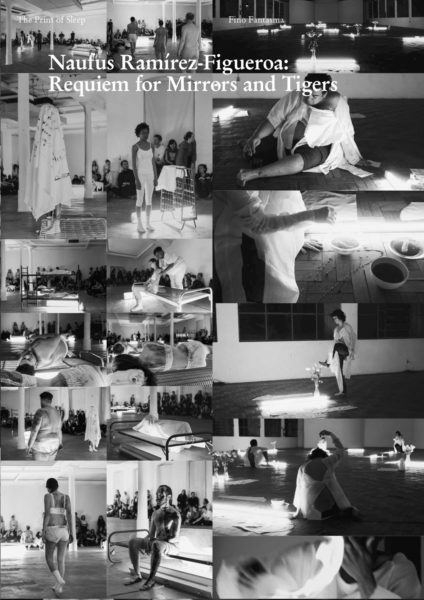 The publication documents the six performances in the cycle via foldout colour posters of each work and an essay by Frédérique Bergholtz and Susan Gibb that describes each performance alongside a reflection on the cycle as a whole. 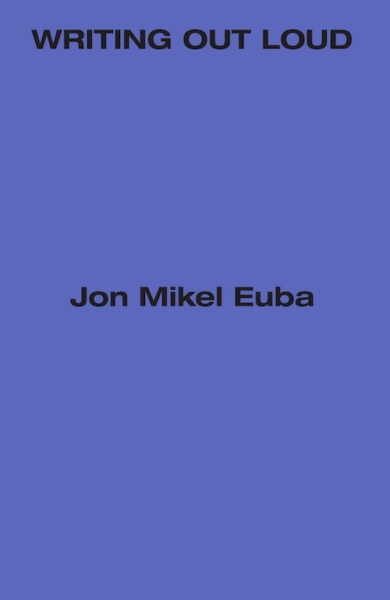 Writing Out Loud brings together transcriptions of eight lectures by artist Jon Mikel Euba that were live-translated from Spanish to English during the course Action unites, words divide (On praxis, an unstated theory) at the Dutch Art Institute, Arnhem. The lectures were presented on invitation of If I Can’t Dance across the academic year 2014–15. The resulting texts sit within a larger writing-centred project by the artist, ongoing for almost a decade, with the aim of defining a form of praxis that could evolve into a technical theory. 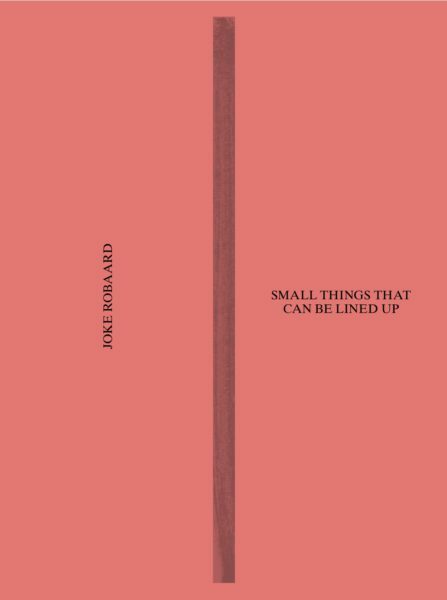 This brochure provides an introduction to Joke Robaard’s Small Things That Can Be Lined Up, commissioned by If I Can’t Dance, and includes images and scripts from the work’s production and a new essay on Robaard’s practice by art writer Amelia Groom. 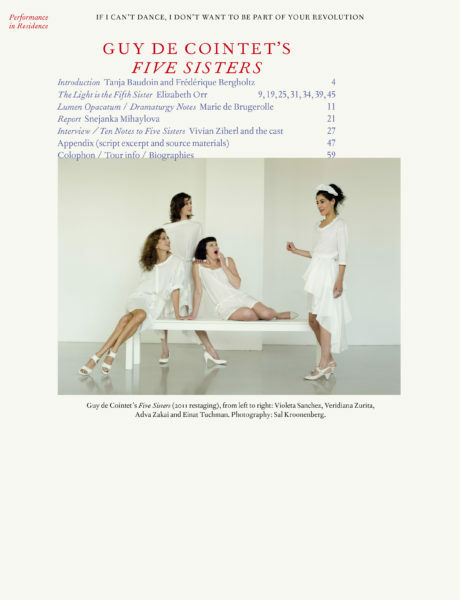 Amateur is the first comprehensive publication about Wendelien van Oldenborgh’s moving-image work and accompanying installations. Developed over the past ten years, these works explore communication and interaction between individuals, often set against the backdrop of a unique public location in order to cast attention towards repressed, incomplete, and unresolved histories. Through the staging of these encounters in film, Van Oldenborgh enables multiple perspectives and voices to coexist, and brings to light political, social, and cultural relationships and how they are manifested through social interactions. The publication is generously illustrated and brings together a wealth of texts by artists, curators, and writers who have been key interlocutors with Van Oldenborgh, and offer in-depth observations and reflections on a work from her oeuvre. 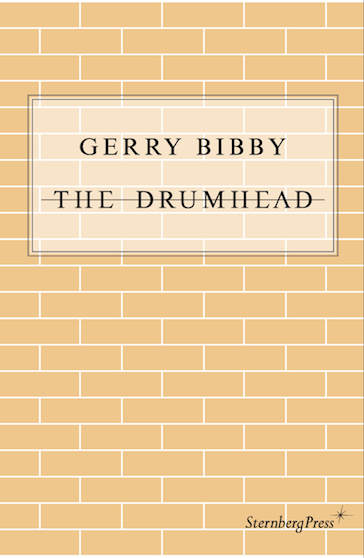 Gerry Bibby’s first publication is a work of fiction that expands on the use of text in his sculpture, performance, and image work. Evoking William Burroughs’s The Wild Boys and Robert Walser’s The Walk, these “language costumes” pay homage to an unruly tradition of radical and queer literary presences over the last century. Their captivating passages brim with wit, wry observation, and (occasional) disgust, offering viewers “ways out,” even if only while reading. Snejanka Mihaylova’s book Acoustic Thought is a poetic exegesis of the Gospel of Thomas: an apocryphal gospel found at Nag Hammadi in Upper Egypt in 1945, containing 114 sayings of Jesus. According to Mihaylova, the Gospel of Thomas “is a poem that listens, where the written is not simply the record of a voice but a radically different dimension of cognition that emerges as an acoustic realm in the formation of thoughts”. 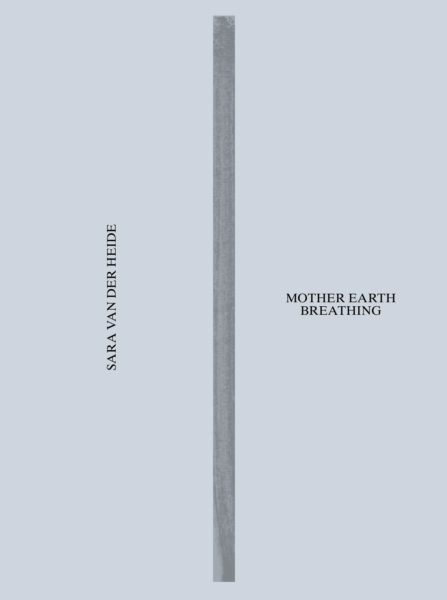 The book includes new texts written by Snejanka Mihaylova, “A Score for Six Voices” by Lisa Holmqvist, and is illustrated with photographs by Jeff Weber made during a research period at the project space Beirut, Cairo. The English manuscript was first edited by Joe Kelleher. 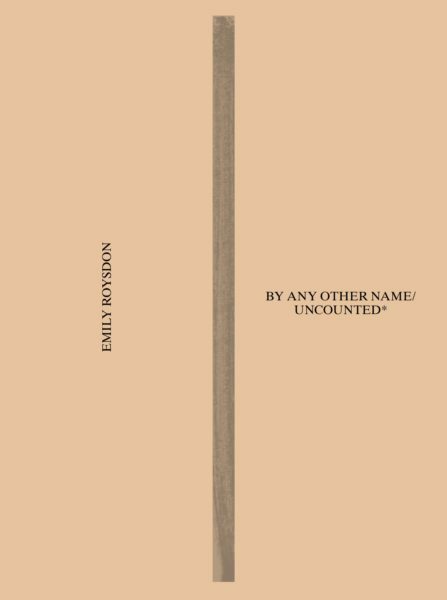 In this brochure, the project is introduced and its chapters laid out with performance images and commissioned images by artist Babi Badalov, along with the original textual score for *Uncounted by Emily Roysdon. With an outline of this new commission, and trajectory of its instalments, this brochure offers a rich selection of images and texts on this artist’s work and a comprehensive essay by theorist Nikos Papastergiadis. 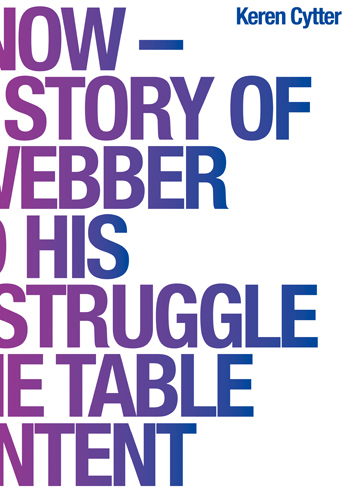 The publication focuses on the development of the performance The True Story of John Webber and His Endless Struggle with the Table of Content, and on the working process within D.I.E. Now, the dance company that was established as a result of Cytter’s collaboration with the performers in this piece. Catherine Wood contributes an essay that situates the performance in the context of the history of international dance; Cytter presents a selection of gestures from the choreography of the performances; and performers Andrew Kerton and Dafna Maimon contribute short essays that offer insight into the different stages of the performance on tour. This book focuses on the performative and the human body in Koester’s work, which is based on intensive archival research and characterized by what he calls “narrative knots”—the multitude of stories, facts and references that make up his notion of history. Drawing on exhibitions and performances presented by If I Can’t Dance during Edition II – Feminist Legacies and Potentials in Contemporary Art Practice (2006–08), twelve critical thinkers confront twelve artists from the perspective of historical and present-day feminism in art. Accordingly, twelve collaborative essays reflect on the state and importance of feminism for art and show how artists today reactivate the past via visual and conceptual “homage”, exploring current ideas of political mobilization and engagement. 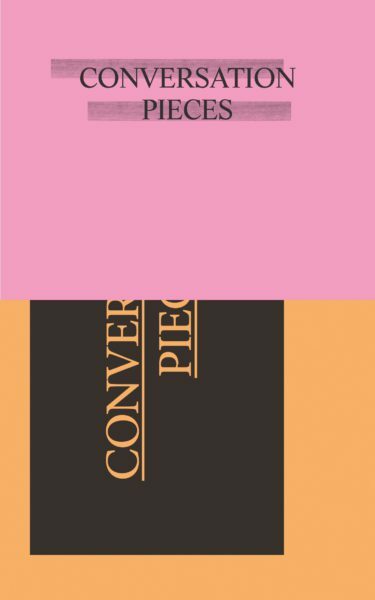 Conversation Pieces is a fruitful starting point from which to discuss subjectivity, social roles, and the politics of performance. The Soliloquy of the Broom is a transcript of a conversation between Olivier Foulon and Michael Krebber on their mutual interest in Gustave Courbet. 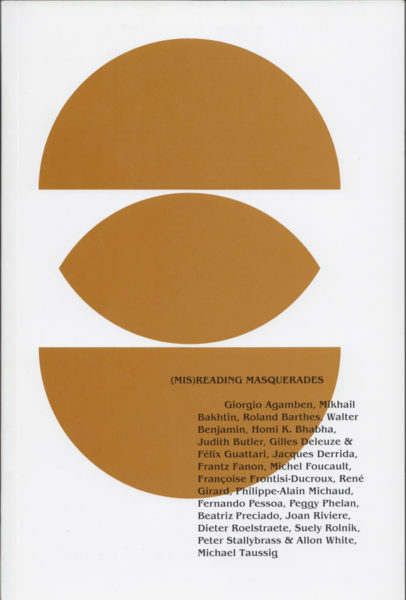 The publication follows from the work Foulon made as part of If I Can’t Dance’s Edition III – Masquerade (2008–10), which focused on the concept of masquerade in relation to painting. In a 16mm film Foulon brought together four paintings of Courbet that are each different versions of the portrait Jo, the Beautiful Irish Girl (1865–66). His film visualizes not only early forms of mass production in art, but also reflects on the concept of a model that is used as a template for a painting that itself then becomes the model for another. This first publication by If I Can’t Dance was printed on the occasion of its inception in 2005. The book traces the year-long experiment in collaborative curating and extended artistic production of the organization, through the projects of Johanna Billing, Matti Braun, Gerard Byrne, Yael Davids, Mariana Castillo Deball, and the group LIGNA. This series of publications accompanies the Performance in Residence projects, which approach performance-related practice through production-led research. 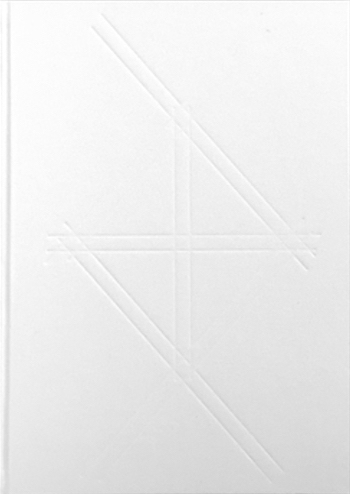 The Performance in Residence publications series is designed by Will Holder, unless otherwise stated. Chroma Lives comprises research of a performative archive project by Erin Alexa Freedman and Lili Huston-Herterich into the group exhibition Chromaliving: New Designs for Living. Taking place in Toronto in 1983, Chromaliving occupied the disused architecture of a former department store and offered audiences a theatricalized vision of contemporary living through a labyrinth-like setting of domestic room displays of artist-made furniture, dressed mannequins, appliances, and interior decoration. Chroma Lives asks how one might reanimate this large-scale exhibition from Toronto’s recent art historical past and suture it to contemporary practices within the city. The publication includes essays by Freedman and Huston-Herterich that provide a history of Chromaliving and of the contemporary exhibition and oral history project they staged to archive this past event. 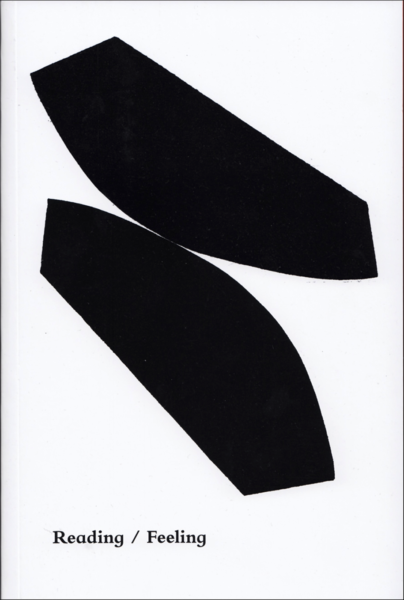 These texts are accompanied by a previously unpublished essay by art historian Rosemary Donegan, which tells the history of Toronto’s vibrant downtown art scene in the early eighties; and generous photographic documentation of Chromaliving and its contemporary restaging Chroma Lives. 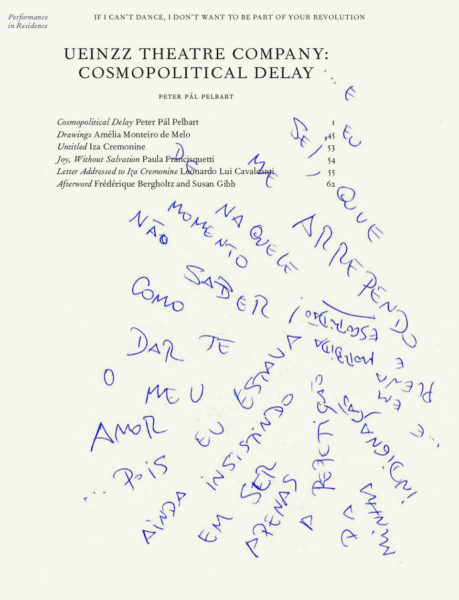 Ueinzz Theatre Company: Cosmopolitical Delay brings together a major new essay by philosopher Peter Pál Pelbart—a member of Ueinzz since its inception twenty years ago—and experiential contributions by other core members of the Brazilian theatre company. The thinkers, actors, philosophers, users of psychiatry, and therapists who make up Ueinzz adopt the theatre as a device “for changing power over life into power for life”. Self-described as a “community of those with no community, for a community to come”, Ueinzz proposes a territory of performance “for all those who feel the world around them is crumbling”. Through personal recollections, fragments of scripts, and philosophical musings, Pelbart rounds out the significance of Ueinzz’s “way of life”. Complementary contributions are by fellow Ueinzz members, including Paula Francisquetti, Leonardo Lui Cavalcanti, Amélia Monteiro de Melo, and the late Iza Cremonine. Invited as a researcher, Gregg Bordowitz posed himself a guiding question: “Is poetics a relevant term for current art-making, and if so how?” With this incisive query, Bordowitz brings to light insights gleaned over three decades of work across video media, art criticism, coalition-based AIDS activism, poetry, and pedagogic practice, while revisiting the concerns in his own work for freedom, autonomy, and self-determination. The publication assembles poetry, epistolary, and critical texts written by Bordowitz from 2013–14. 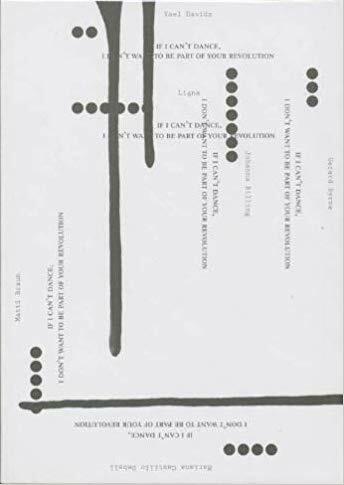 In addition, it includes poetry and essays by Robert Duncan, a psychoanalytic text by Wilfred Bion, and poetry by Essex Hemphill and Ari Banias. 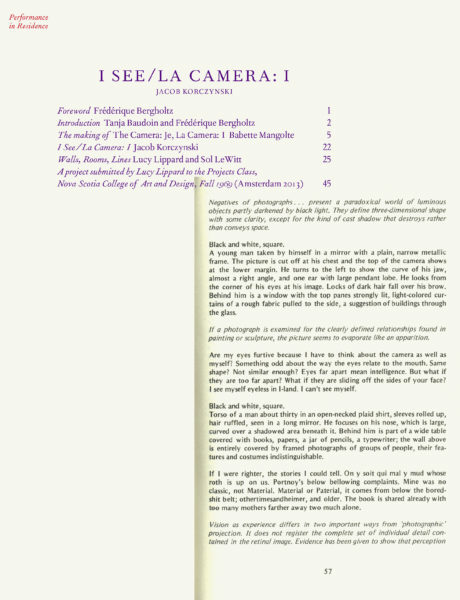 For I See/La Camera: I, Korczynski took Babette Mangolte’s film The Camera: Je, La Camera: I (1977), and Lucy Lippard’s novel I See/You Mean (1979) as starting points for his research into the relationship between the subjective role of the camera in Mangolte’s film and the simultaneous exploration of text and image in Lippard’s novel. I See/You Mean and The Camera: Je, La Camera: I are situated in the context of feminist strategies of self-portraiture. 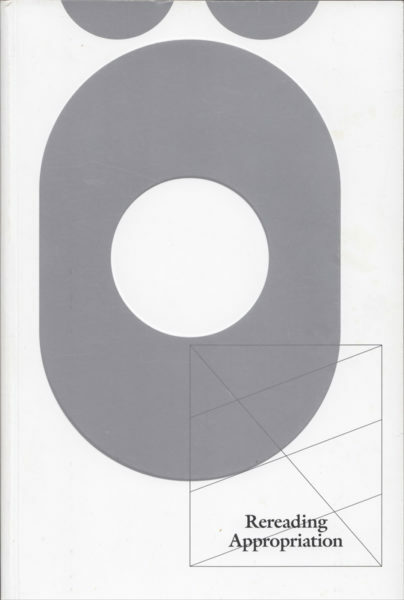 The publication includes a research essay by Korczynski, a visual essay by Babette Mangolte, and a collaborative text/drawing by Lucy Lippard and Sol LeWitt produced during the development of Mangolte’s novel. Louise Lawler’s A Movie Will Be Shown Without the Picture (1979) presents a movie in a regular cinema environment, but without any moving images. The movie accentuates the experience of watching a movie and foregrounds the performative aspects of the practice of an artist who is perhaps best known for her photographs of “arranged” artworks and objects. This publication is the result of extensive research project on A Movie and its 2012 iteration, undertaken by researcher Sven Lütticken and Louise Lawler for If I Can’t Dance. 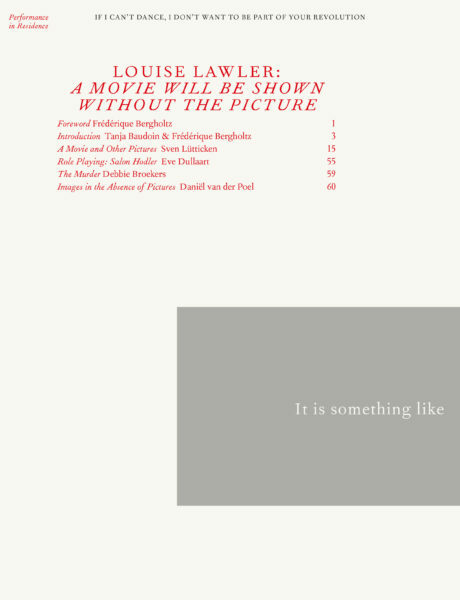 The publication includes a research essay by Lütticken that places A Movie in the context of cultural developments in the 1970s and contemporaneous works by the Pictures Generation, a sequence of images selected by Lütticken from Lawler’s archive, and contributions by art historians Debbie Broekers, Eve Dullaart, and Daniël van der Poel. Grant Watson’s How We Behave was inspired by an interview of the same title with Michel Foucault, published in Vanity Fair in 1983, in which Foucault asked, why can’t life be the “material for a work of art?” The project by Watson extends this provocation by asking: “If art is expanded to include life practice, then how does the curatorial intervene?” In more than fifty interviews, conducted in New York, São Paulo, Los Angeles, San Francisco, London, and Amsterdam, the project explores how people shape their lives. 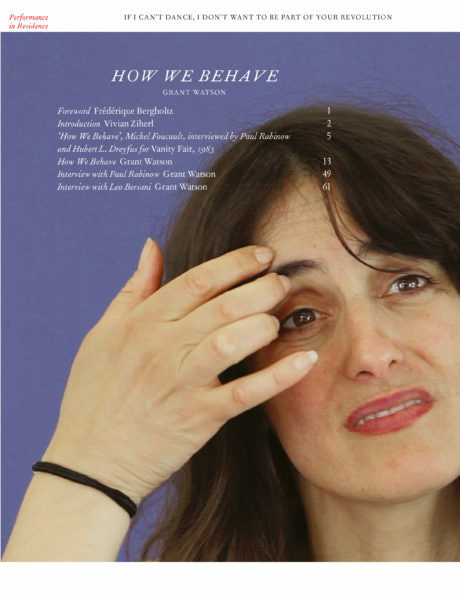 This publication includes stills of the video portraits, an essay by Watson introducing the notion of the “care of the self”, the original Vanity Fair interview, and interviews with Leo Bersani and Paul Rabinow. Since the late 1970s Matt Mullican has developed a practice of performing under hypnosis that extends from his investigations into representation and subjective projection, and from his efforts to “enter the image” and embody a fictional character, a body of work that offers an exceptional perspective on repetition and renewal in performance practice. 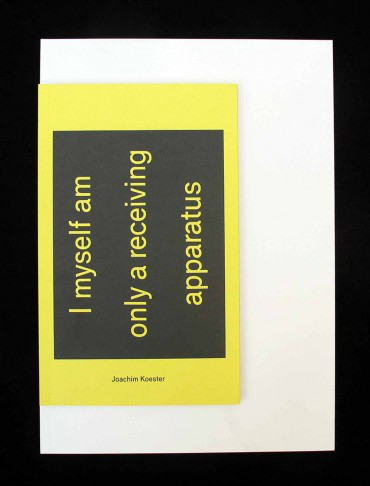 This book is the outcome of an extensive research project into Mullican’s hypnosis performances, undertaken within the frame of If I Can’t Dance’s Performance in Residence programme with invited researcher Vanessa Desclaux, and a two-day Class of Masters with Mullican on character construction. Desclaux takes up the question of personification in light of her analysis of Mullican’s hypnosis performances. 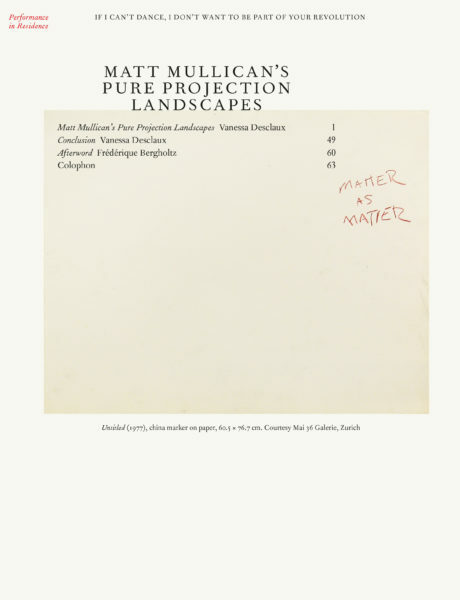 A selection of Mullican’s photographs and works on paper are reproduced in this book. This publication concentrates on Five Sisters, a performance Guy de Cointet developed together with Light and Space artist Eric Orr in 1982. In Five Sisters, the affective well-being of five women is explored as they have changing, restless encounters in their parental home, discussing issues around wardrobe, suntans, health, exotic holidays, work, and painting. The play holds an exceptional place in De Cointet’s oeuvre, as it presents a shift in his attention to the emotional quality of objects towards light and colour. 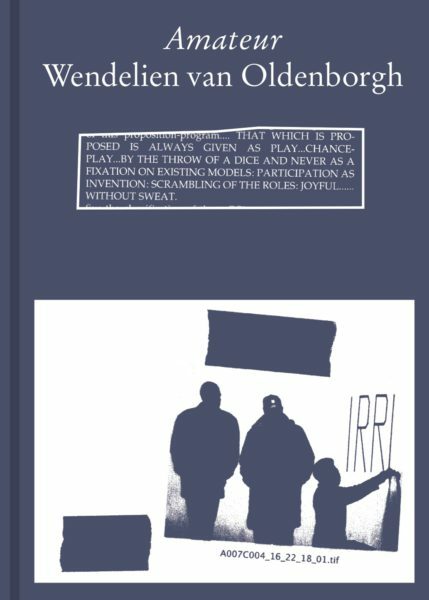 This book is the outcome of an extensive research project around the restaging of this performance with If I Can’t Dance, reflecting the research questions that emerged around the meaning, sources, and context of the original performance and its restaging. This bilingual publication collects twenty-two stories by invited artists and cultural practitioners in dialogue with the work of artist Isidoro Valcárcel Medina. Each story responds to one of eighteen photographs featuring Valcárcel Medina restaging actions previously performed in public spaces of different cities between 1965–93, this time in Madrid in 2011. Across 2012 these photographs were exhibited in a number of institutions under the title 18 Pictures and 18 Stories. At each exhibition three guests were invited to tell a story based on a photograph. During the telling of these stories Valcárcel Medina was available via phone to answer any questions the storyteller or audience might wish to ask. 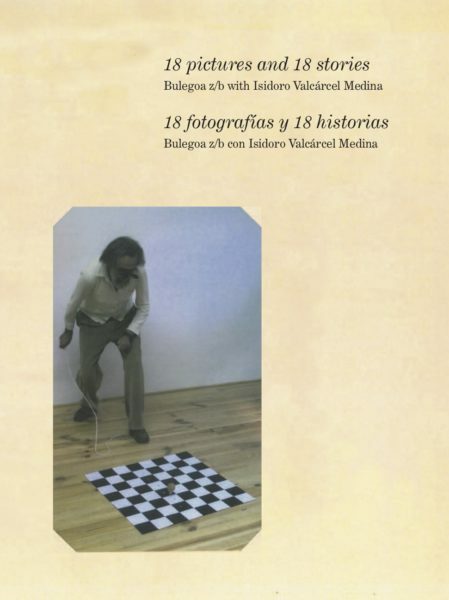 This publication hosts all the interpretations, facts, and fictions that were told, offering a spectrum of approaches to the work of Valcárcel Medina.